There are numerous office chairs in the market, each with its unique features. They can suit different kinds of people and according to their preference. Each of these chairs has its advantages and disadvantages. Choosing the correct office chair for you is quite a challenging task. You have to consider very many things like back support, arms comfortability, color, and even design. 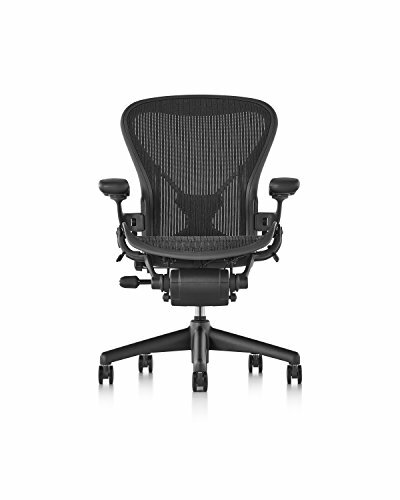 The Herman Miller Classic Aeron Chair is the newest chair in the market. It has unique features and comfortable material alike. It is quite affordable and suitable for people with different needs ranging from height to weight. This chair consists of Pellicle- a breathable and woven membrane instead of the regular foam in most chairs. Unlike the old fashioned office chairs which were wholly made from foam, this new design chair is made of breathable woven material known as Pellicle. This membrane covers the backrest and seating area. This material is significant such that it keeps away excess heat buildup and pressure if you sit on it for long. The material is also elastic, and with it, the chair does not need to have excess foam padding since its elasticity holds the other parts in place. The patented pellicle can also be recycled when the seat is old and be used for other purposes. This protects the environment from pollution. 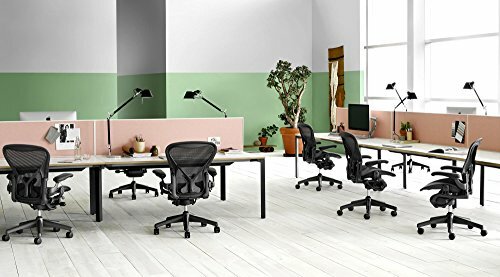 Herman Miller Classic Chair comes in three different sizes that can fit everybody regardless of their body size. Whether you are short, tall, heavy or light, you will get a chair that will make you comfortable during your working hours at the office. Its sizes include the small size, known as size A, Medium size (B) and Large size(C). Its weight vs. height ratio advice that Size B is perfect for individuals between 5’5” to 6’2” tall and about 200 pounds. This is the average chair for an average4 person. This chair has a unique tilt that helps you to move your whole body. Some of the critical points with pivots to move to include the knee region, at the ankles and the knees. These points have a smooth finish making you feel balanced when moving and reclining your back. This standard seat has a superior hip bone support to keep you seated supporting your delicate spine. It releases pressure from your hip region keeping away fatigue. Furthermore, your lumbar region is well supported to give you an easy time when seated for a longer time. It is made of breathable material which keeps away excess heat and pressure buildup. Comes in different sizes to fit everyone regardless of their weight and height. Strong tilt to enable you to move your body parts and without much struggle. The armrests are not adjustable. You will have to cope with their set height which could be a bit uncomfortable. It only comes in one color, a mixture of grey and black. Can the arms be separated from the main chair? Answer: No. The arms are finally placed into their position and can not be adjusted. Doing this would mean you spoil it and it can cost you. Is the chair new or second hand but well refurbished? Answer: This chair is brand new manufactured by the Herman Miller, and only them can allow its sale. It also comes with a warranty of 12 years direct from the manufacturer. Where can I buy this seat? Answer: Our new chair can be purchased at any OfficeDesigns outlet. It is also available at the Amazon online store. To sum it up, it is essential that you choose an office chair that will make you comfortable. You will surely enjoy a tiresome day at work. Our Herman chair is by far the best chair ever seen in the world of business. Due to these features, after its release, a sample of this chair was kept at the New York Museum as one of the modern and unusual arts worldwide. If you are a person who spends most of your day on your computer at the office, an uncomfortable chair can be very dangerous to your back and lumbar region. A bad chair can give you back pains and change your posture. This is why it is critical to choose the correct chair.